At the crossroads of the Sentier quarter, the Opera and Republic Square, our hotel est ideally located if you are in Paris business or Leisure ! Fully renovated in 2015, Hotel Bonne Nouvelle is a boutique hotel in Paris, located in the historical part of the city. Charming and quiet, our hotel will delight you with its location and its proximity to public transport. Also renovated in 2015, we offer single, double, twin and triple accommodation .All rooms are accessible by lift but our hotel is not accessible to people with reduced mobility. Our reception is at your disposal to indicate you equipped hotels nearby..
Hotel Bonne Nouvelle is at 200 meters from Bonne Nouvelle subway station, on lines 8 and 9, giving direct access to the Opera Garnier. A just minutes away by subway from the Roissy Bus shuttle between the center of Paris and Roissy Charles de Gaulle Airport (CDG). Combining charm and comfort, our renovated rooms are decorated in a simple style, fresh and modern and have all the amenities today's traveler need! Our front desk is at your disposal 24/24 to facilitate your stay in the French capital and make it as memorable as possible. Our hotel is close to metro stations Bonne Nouvelle and Strasbourg St Denis allowing you to quickly cross Paris from North to South and East to West. Located in the heart of Paris, near the largest public transportation stations, Hotel Bonne Nouvelle is 15 minutes from Gare de Lyon and 20 minutes from Gare Montparnasse. OrlyBus connects Place Denfert-Rochereau in Paris Orly Aeroport. 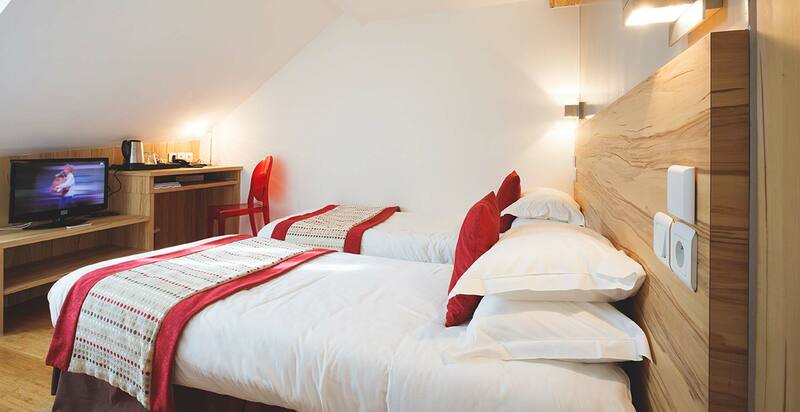 Thanks to the RER B, Hotel Bonne Nouvelle is a only at twenty minute from OrlyBus! 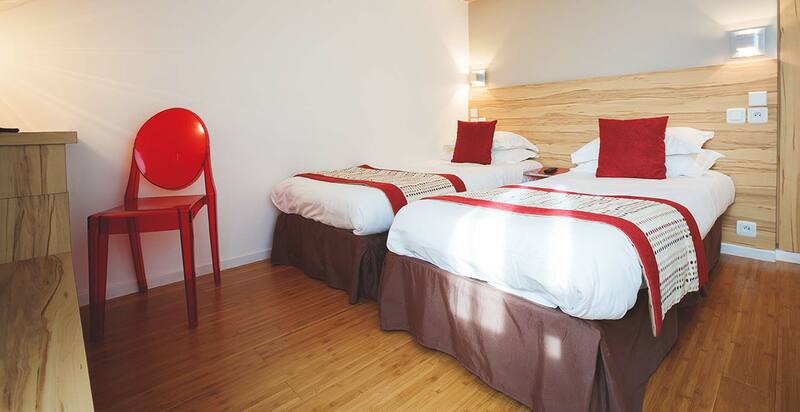 The Hotel Bonne Nouvelle offers accomodation ranging from single to triple with choice of 3 single beds or 1 double + 1 single. All our ensuite rooms are accessible by an elevator . Our rooms will please the single traveller. Peacefull, they all are Nos chambres simples raviront les voyageurs solitaires. Quiet and peaceful, they are all equipped with a private bathroom with a shower or a bath. Accessible by elevator, all our single rooms have a free wireless internet access offered by the hotel. All children under 3 years stay free of charge when using existing bedding..
Our newly renovated double rooms are comfortable, equipped with flat screen TV, hospitality products and benefit from all the freebies of our hotel. We also offer you twin rooms with two single beds. All children under 2 years stay free of charge in cots. Our triple rooms benefits of all the avantages of our single, double rooms. Our triple rooms are spacious and well thought out with a free wifi connexion. We offer a choice of beds for our triple rooms with either 3 single beds or one double bed and a single bed. Groups of friends as well as families will be satisfied! You don't have to just take our word, have a look to what our clients have to say about the Hotel Bonne Nouvelle. NWe have a lot of satisfied and returning customers, have a look to what they have to say in the guestbook page of our site. Bounded on the north by the Boulevard Bonne Nouvelle is traditionally known as the temple of the textile industry in Paris, the Sentier district also became "Silicon Sentier" in reference to many IT companies, such as Yahoo, which are implanted in the neighborhood. The Sentier district has also inspired many French writers such as Balzac and cinematographers as Thomas Gilou. Located in the center of Paris, in the Ist district, the Halles quarter was the largest market in Paris. Today the Halles quarter is not only Paris shopping Mecca, thanks to the Forum des Halles but also home to many theaters, bars and restaurants. Its small cobblestoned pedestrian streets and promise of pleasant walks in the Old Paris. Located at fifteen minutes walk from the Hotel Bonne Nouvelle, the Republic Square and his statue, The Triumph of the Republic. This is the rallying point for the French during all major events marking the life of the country. Historical square, the Republic Square is also home to one of the largest metro stations in Paris. The Republic quarter is well known for its many shops and especially the Saint Martin Canal nearby. Located in the hyper center of Paris, Hotel Bonne Nouvelle offers you more than a great location. If you stay in our hotel you will appreciate our newly refurbished rooms still at budget price ! have a look at all the advantages of our hotel ! Being located in the hyper center of Paris, close to metro lines 3 and 9 and at less than 5 minutes from line 4, our hotel allows you to quickly move throughout Paris! Without forgotten the many activities at a reasonable walking distance from our hotel! Many small restaurants and eateries are nearby Hotel Good News, You'll be spoiled for choice: Kosher, Italian, maroccain, Chinese, etc. Hotel Bonne Nouvelle is close to many theaters and show venues such as Modagor theater, theater of the Gymnasium, the Splendid. The second district of Paris is also known for its nightlife thanks to the Grand Rex, a few blocks from our hotel. 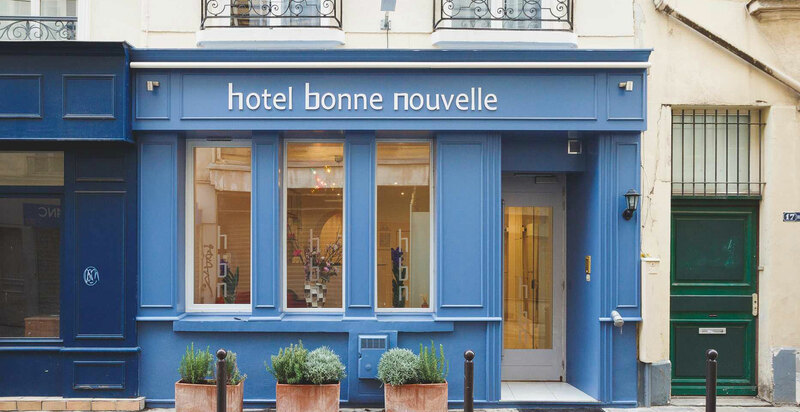 Hotel Bonne Nouvelle offer its special offers and lowest rates only on its official website ! Having at heart to pamper its clients, the Hotel Bonne Nouvelle also offers to his loyal customers exclusive deals! Feel free to email us or contact us by phone. Our reception is open 24/24 for your reservations as well as to answer all your questions. Please contact the reception of our hotel for all group bookings. We also encourage works councils to contact us directly. Hotel Bonne Nouvelle is located in Beauregard Street, a quiet street in the second district of Paris between the Sentier district, Les Halles and Republic. Our hotel is ideal for business travelers due to our central location and perfect for exploring Paris with confidence and without breaking the bank! 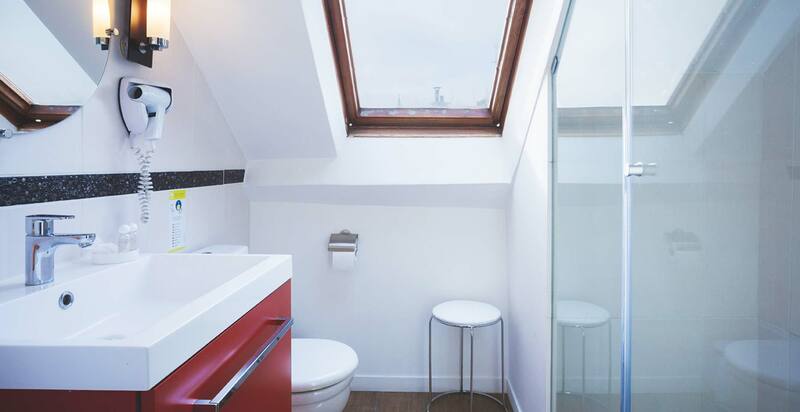 Your budget boutique hotel, in the Sentier in Paris!